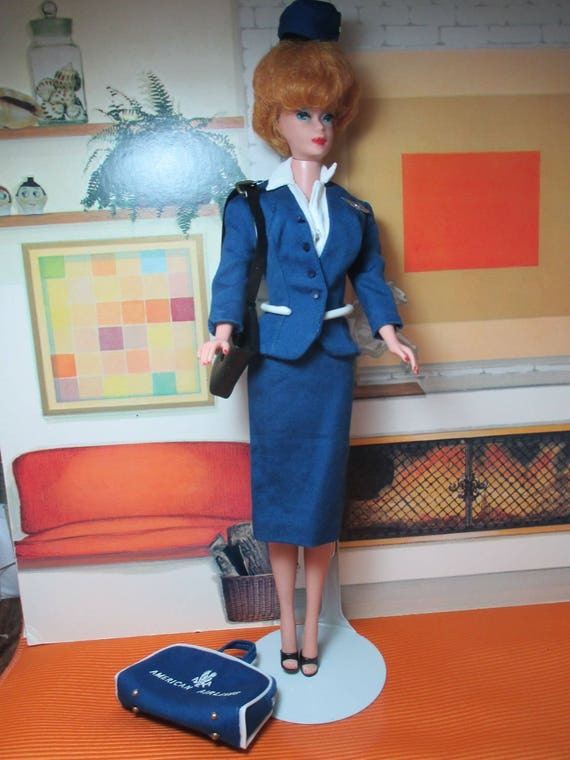 Tailored navy cotton two piece suit jacket with silver metal wings on lapel, a navy sheath skirt, bright white nylon body blouse,hat with wings, black vinyl shoulder purse, "American Airline logo" zippered flight bag, black open toe heel shoes. All snaps and buttons are intact and tight. The Barbie black and white tag is in the jacket. Outfit is clean with no holes, rips, stains or odors. This is one of the most pristine American Airlines outfits I have seen. Blouse is super white and nice. Even has the little pull on the flight bag. American Airlines Flight Stewardess will come presented on colorful heavy card stock paper in a clear plastic, acid free bag to protect the outfit. Perfect to give as a gift!